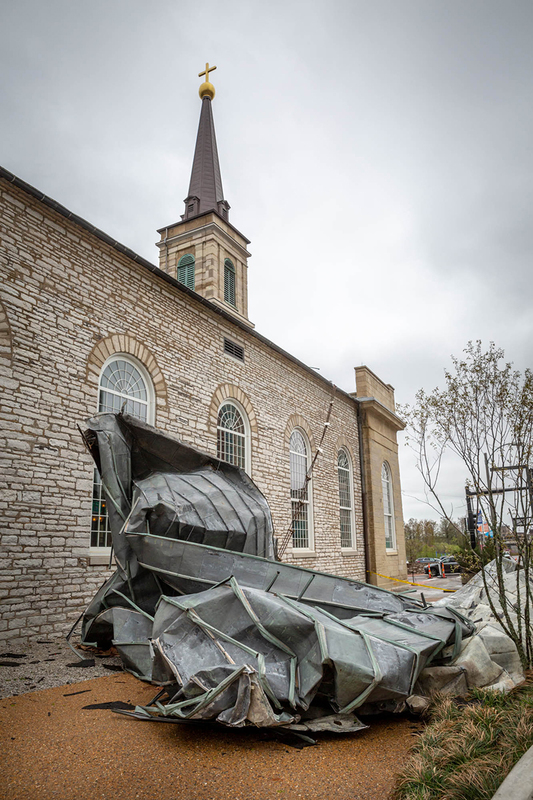 Workers looked at a large portion of the terne metal coated copper roof that blew off of the Basilica of St. Louis King of France (Old Cathedral) in the early morning of Palm Sunday. Masses were cancelled that day, and it is unclear if Masses will be celebrated at the basilica for Easter. Holy Thursday Mass, 5:30 p.m.
Easter Sunday Masses at 8 a.m, 10:30 a.m., and noon. Father Richard Quirk said the planters used to display palms on Palm Sunday ended up being a Godsend. The Saturday evening Vigil Mass at the Basilica of St. Louis, King of France (Old Cathedral) had been celebrated, and the priests there got a good night’s rest, anticipating a full schedule of Masses on Palm Sunday, the official ushering in of Holy Week. But when they woke up the next morning, they discovered that most of the roof, made of terne metal coated copper, had blown off in the wee hours of the morning. A large portion of the roof blew off of the Basilica of St. Louis King of France (Old Cathedral) in the early morning of Palm Sunday. Water seeped through the light fixtures in the plaster ceiling, and that’s where the planters came in handy to catch water dripping from the ceiling. “If it wasn’t for putting the palms around in the plant buckets, God only knows,” said Father Quirk, associate pastor. The National Weather Service in St. Louis reported a burst of strong winds developed southwest of St. Louis around 2 a.m. on April 14. Winds pushed through St. Louis and into central Illinois, reaching anywhere from 50-60 miles per hour. There were widespread reports of damaged trees, downed power lines and other structural damage. Masses were canceled on Palm Sunday and the early part of the week as damage was assessed. Masses will resume on Holy Thursday at 5:30 p.m.; celebration of the Lord's Passion on Good Friday at noon; 8 p.m. Easter Vigil Mass on Saturday; and Easter Sunday Masses at 8 and 10:30 a.m. and noon. The Old Cathedral is located at 209 Walnut Street. A permanent membrane has been installed on the roof to prevent water infiltration until a permanent roof is installed. The Old Cathedral will be working with the National Park Service to ensure the replaced roof respects the architectural historical nature of the building. The 100-plus-year-old roof was not part of a $15 million restoration effort, which began in 2013 and was completed in 2016. The 185-year-old building underwent an interior renovation, stripping, repairing and refinishing the oak pews, confessionals and altar railing and the original maple floor. The walls, ceiling, statuary and decorative millwork were restored and repainted, mosaic floor of the sanctuary repaired and mechanical, electrical and HVAC systems updated. Lighting changes were made to highlight the architectural integrity of the building as conceived in the 1830s. Outside, the original limestone facade was restored, windows replaced, roof, gutter and steeple repaired. The church is the first cathedral west of the Mississippi River and was the only church of any denomination for local settlers until about 1816. It is truly the “Mother Church” of St. Louis, the first permanent church in St. Louis, and the 1834 church was the first Cathedral west of the Mississippi River. Workers covered with tarps the roof of the Basilica of St. Louis King of France (Old Cathedral). High winds damaged the roof of the basilica early in the morning of Palm Sunday April 14. The current church structure was completed in 1834, with a renovation to give it its current look which began in 1853. The structure is a prominent example of Greek Revival architecture in the United States, and it is included on the National Register of Historic Places. The exterior stone facade and the four columns that support the Doric style portico are carved from Joliet stone, mined near Joliet, Ill.
Father Quirk said the National Park Service at the Gateway Arch called the Old Cathedral about 4:30 a.m. to report the damage. Three-quarters of the roof on the west side of the church had slid off and into a jumbled heap just in front of the entrance to the Old Cathedral museum. 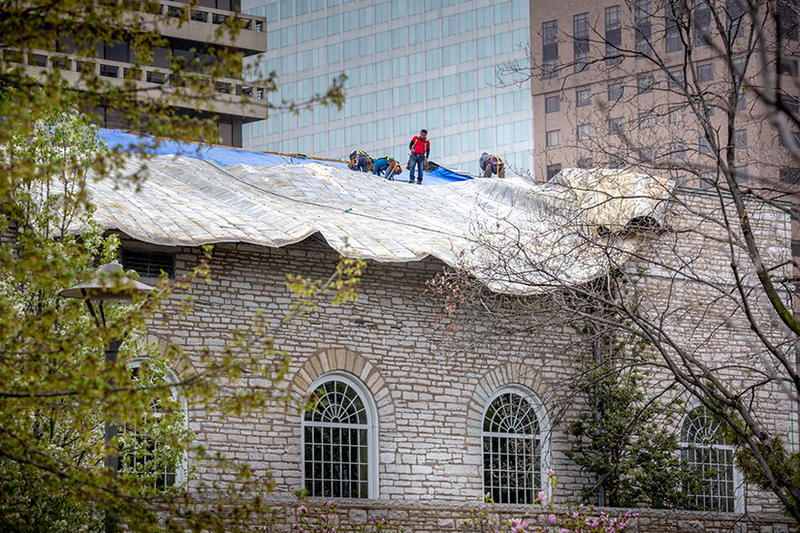 The roofing on the east side of the church partially had begun to slide off but was secured and was removed. Archbishop Robert J. Carlson, who stopped by the church April 14 to assess the damage, said the archdiocese is committed to restoring the roof.